I moved from Georgia, a humid subtropical climate that gets 54 inches of rain a year (far more than the US average of 37), where today's weather forecast is to reach 89 (one of the few days of the summer that'll be below 90), and a low of 67 with 51% humidity, to Aspen, a more arid climate, with a high predicted to reach 75, a low of 47 with 28% humidity. In Atlanta, fall colors are weeks away – usually in late October, yet here in Aspen peeks of yellow are already changing the landscape. Of course the altitude and latitude are the major contributing factors. The coordinates in Atlanta are: 33°45′18″N 84°23′24″W with an altitude of 1050 feet. 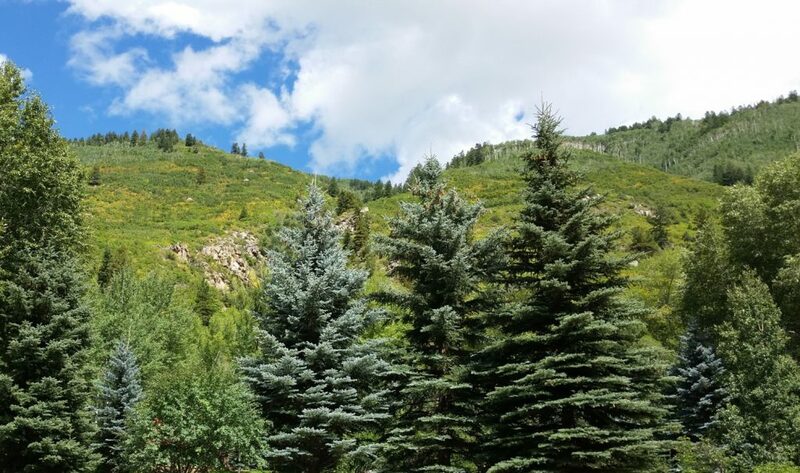 Aspen is locaed at: 39°10′54″N 106°50′26″W with an altitude in the town of 7908. (The mountains reach thousands of feet higher). One of the reasons I moved here is the cooler nights. There's nothing like the comfort of cuddling up in blankets to foster a good night's rest.